The Water and Sanitation Program (WSP) of the World Bank nominated Palli Karma-Sahayak Foundation (PKSF) for an exposure visit from 15th to 22nd May, 2016 to exchange learning on sanitation. The WSP is working to improve rural sanitation at scale in more than a dozen countries across Africa, East Asia and South Asia. 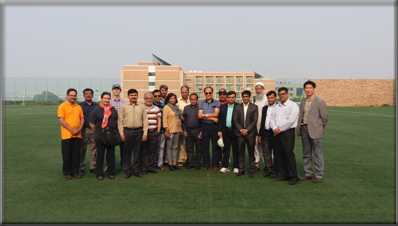 The said Study Trip, consisting nine delegates including Government officials, was headed by the Managing Director of PKSF, Mr. Md. Abdul Karim. This trip was intended to focus on achieving total sanitation. It provided valuable exposure to the process and policy initiatives adopted by the South Korean Government to achieve total sanitation in the rural areas. It has also made valuable insights over promoting community based total sanitation approach. One of the main objectives of this exposure visit was to enhance capacity amongst WSP’s Partners. On an arrangement of exchanging mutual experiences, the Managing Director of PKSF shared his views on the respective matter. Two senior officials of PKSF, namely, Mr. Golam Touhid, Deputy Managing Director, and Mr. Md. Abdul Matin, Deputy General Manager, who are involved with the implementation of WSP supported project, took part in it. The project is called Scaling up Microfinance Institutions (MFI) Lending for Improved Rural Sanitation in Bangladesh. At the completion of the mentioned Study Trip the Managing Director of PKSF paid a short visit to a closing session of the Training on Crab Hatchery Production and Crablets Incubation for PKSF and NGF Technicians arranged by Research Institute of Marine Fisheries (RIMF), HaiPong City, Vietnam. Mr. Karim was the Hon’ble Chief Guest. He expressed that both Vietnam and Bangladesh will keep on carrying the transferring of various technologies essential for mutual development.